After making his equipment-care rounds, a maintenance technician has discovered that several bearings are “running hot.” These bearings are added to a list for some form of action. A work order may be written to change the bearings, or someone may put cooling water on the bearing housings. Even if the actual bearing temperatures are known, often times no one truly understands what actions are required at which temperatures. Before any action is taken, the question of how hot the bearing is should be answered. Hot to the touch might only be 130 degrees F, as 120 degrees F is generally the threshold temperature where you can still hold your hand on the surface. While there may be gray areas for identifying the appropriate action at certain temperatures, some guidelines can provide consistency and help plant personnel make better decisions. The first step should be to determine the actual temperature of the bearings being monitored. Keep in mind that the temperatures measured are only the skin temperatures of the bearing housings. The actual bearing temperatures will be 15-25 degrees hotter. Observe the surface condition and type when measuring temperature. Also, ensure the measuring device’s emissivity is correct for the surface being measured. Most dark carbon-steel surfaces will have an emissivity setting around 0.95, while shiny stainless steel or aluminum will have a much lower setting. 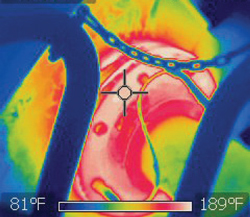 A typical infrared camera shot is shown below. 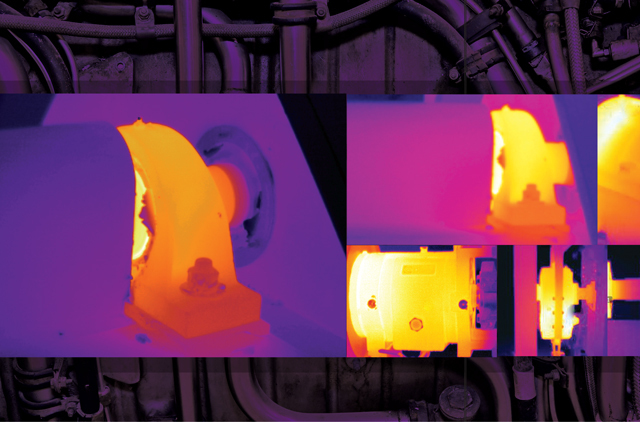 Process buildup on bearing housings can result in lower measured temperatures when the actual bearing temperatures are much hotter. Buildup will insulate the bearing and not allow it to dissipate heat, which will in turn make the bearing run even hotter. Temperature checks should be performed in the same locations on the equipment and the bearings. Variations in bearing temperatures can be expected when different locations are measured due to load zones, ambient temperatures, lube levels, etc. Consistency is also important when different individuals are taking the measurements. Most precision installed and lubricated equipment will operate at less than 180 degrees F. A bearing temperature that is less than 180 degrees F is typically considered acceptable (see the chart below). Of course, there may be other consequences for operating in this “good” range. A higher operating temperature will cause the bearing lubricant to deteriorate at a faster rate. At more than 150 degrees F, the lubricant life can be cut by 50 percent for every additional 18 degrees F. A higher operating temperature also means a lower operating viscosity for the lubricant, which may hurt the overall reliability of the equipment. 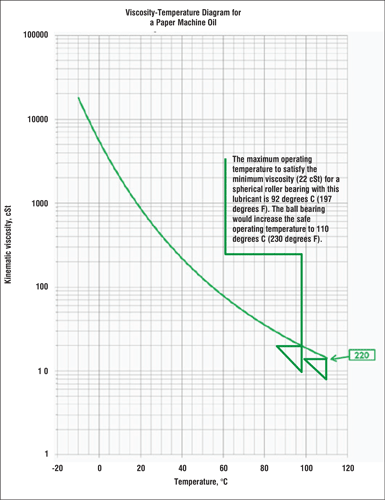 The diagram below shows how the maximum temperature for a specific lubricant (viscosity index) and bearing type may limit the maximum operating temperatures. In a caution condition, the bearing temperature may be between 180 and 200 degrees F. While this is slightly higher than desired, it may be a typical operating temperature for some equipment. Therefore, it is essential to have an operating temperature history for equipment in this range to determine if the temperature is normal. For gearboxes, sump temperature limits are less than 200 degrees F, as defined by the American Gear Manufacturers Association (AGMA). A C3 clearance bearing is typically considered for this operating temperature. Continue regular monitoring and watch for any significant changes in temperature. Another factor that is just as critical as the absolute bearing temperature is a change in temperature, which is an indication of a condition change. A temperature change of more than 50 degrees F is of concern no matter what condition range in which the absolute temperature falls. Increased monitoring and investigating should be required with this type of change. Small temperature changes are generally of little concern. It may be normal for a recently greased bearing to increase in temperature 25-30 degrees F. Machine speeds and loads as well as ambient conditions (winter/summer) will also affect absolute temperatures. Other factors that can cause higher temperatures include increased bearing friction (poor lubrication, high load, high speed, etc. ), excessive lubrication (grease overpressure), high oil level (oil churn) and misalignment. In an alert condition, the bearing temperature may be between 200 and 250 degrees F. These elevated temperatures may be due to a heated application, a recently greased bearing, oil level issues, early stages of bearing failure, etc. Be sure to verify the process conditions, recent greasing cycle or oil level. You may also need to increase the frequency of monitoring the temperature changes. The safe operating temperature for grease is typically 75 percent of the dropping point. If the bearing is running in an application with heat through the journal, this elevated temperature range may be normal for operation. This would also call for a C4 clearance bearing. In an alarm condition, the bearing temperature may be between 250 and 300 degrees F. Bearings operating in this temperature range likely are in some stage of failure. The amount of life left can be highly variable. Employ other predictive technologies (vibration, infrared, ultrasonic testing, etc.) and increase the condition monitoring frequency until corrective action is taken. Also, minimize stress on the bearings by limiting startups/shutdowns and reduce process speed/load changes. 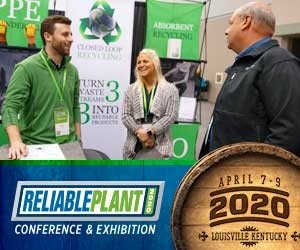 Begin preparing a maintenance plan (order materials, define the job scope, etc.) for executing corrective action for either a planned event or unplanned failure. Use care when lubricating any bearing in an alarm condition, as lubricating (especially greasing) can elevate the operating temperature and even lead to failure. In an equipment trip/shutdown condition, the bearing temperature may be more than 300 degrees F. Bearings at this temperature are likely in the final stages of failure. Depending on the equipment design, failure can be rapid and catastrophic. The time to react may only be hours, not days. At this point, the bearing is gone, so your actions should be focused on minimizing a secondary failure of the remaining components (shaft, housing, etc.). An immediate equipment trip/shutdown may be recommended to prevent catastrophic failure and additional damage. The bearing integrity and geometry can be severely compromised at this temperature range, as the heat stabilization temperature for many bearings is between 300 to 400 degrees F. Do not attempt to grease a bearing in a shutdown/trip condition, since this is likely to result in an immediate failure. If the bearing temperature is severely elevated, spraying with water could cause it to explode. Do not put water on the bearing or bearing housing. Water can migrate into the bearing and lead to a breakdown of the lubricant film. Corrosion can also occur. Cooling the housing of a hot bearing can remove bearing clearances when the outer race cools, as the inner race will still be hot. The reduction in radial internal clearance will increase bearing friction and drastically reduce bearing life. The potential of catastrophic failure is also increased. Smaller bearings have a greater risk of this occurring due to their small radial internal clearances. Using a fan on a bearing housing can be an acceptable cooling method for a bearing in an alert or alarm condition. If the bearing is on a circulating oil system, increasing the oil flow may also cool the bearing. However, too much oil flow can cause oil churn and increased friction inside the bearing. If a bearing continually operates in an alert or alarm condition, you may need to consult an expert to evaluate the risk of continued operation and to identify possible changes for improvement. These bearings that persistently run at elevated temperatures have a chronic problem and require analysis to determine the root cause. While bearing temperature monitoring can be relatively simple, the decisions that result will necessitate an evaluation by trained professionals to ensure the best course of action is taken to maximize equipment reliability.